A third-year at L'Ecole des Cinq Lumieres, Komachi is kind and shy, and likes to read books and write. However, once she is angered enough, she will snap and release her temper. Along with her best friend Karen Minazuki, Komachi is a popular senior at her school. She is a volunteer at the school library, along with Karen and often spends her time there writing stories. Her dream is to become a writer, and she exhibits particular talent in this: Nuts praised her first completed story (upon the 7th revision), and he does not give praise lightly. She has romantic feelings for Nuts, which she expresses in the form of her second novel. Her parents own a traditional Japanese sweetshop. 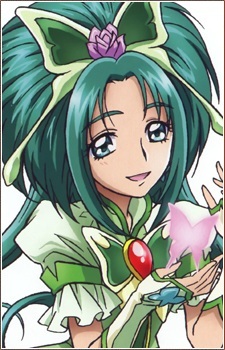 The green-clad Cure Mint is the counterpart of Cure Aqua. For catching Pinkies, Coco gets a flute/piccolo from her Pinky Catch. Fans noted that her appearance is similar to Lettuce Midorikawa of Tokyo Mew Mew. She introduces herself as "Tranquility of the Green Earth, Cure Mint!" (安らぎの緑の大地キュアミント!, Yasuragi no midori no daichi, Kyua Minto!). In the first movie, her counterpart is Dark Mint, who is voiced by Yūko Minaguchi.